This gallery showcases small kitchen design ideas for a variety of styles. Those with a small kitchen space know it can be a challenge to a get an efficient kitchen that looks attractive and still remains functional. 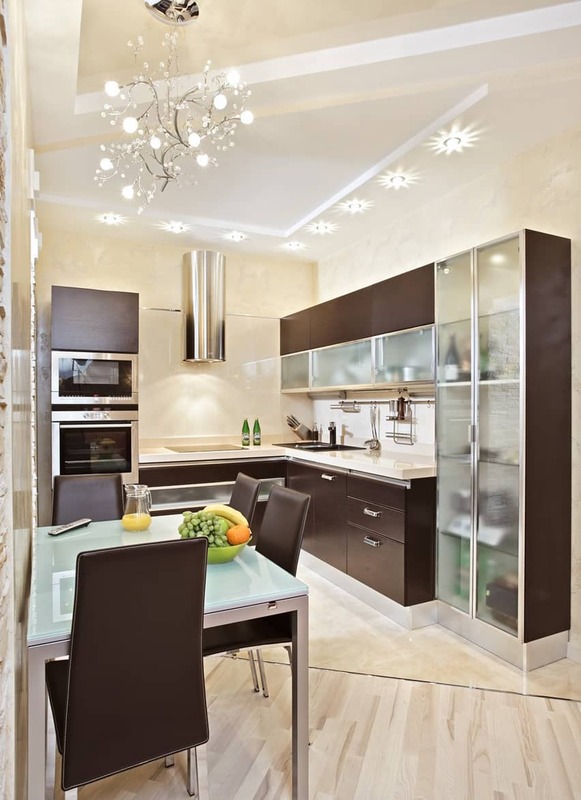 Below are many interior designs to give you ideas to get more out of a small kitchen layout. 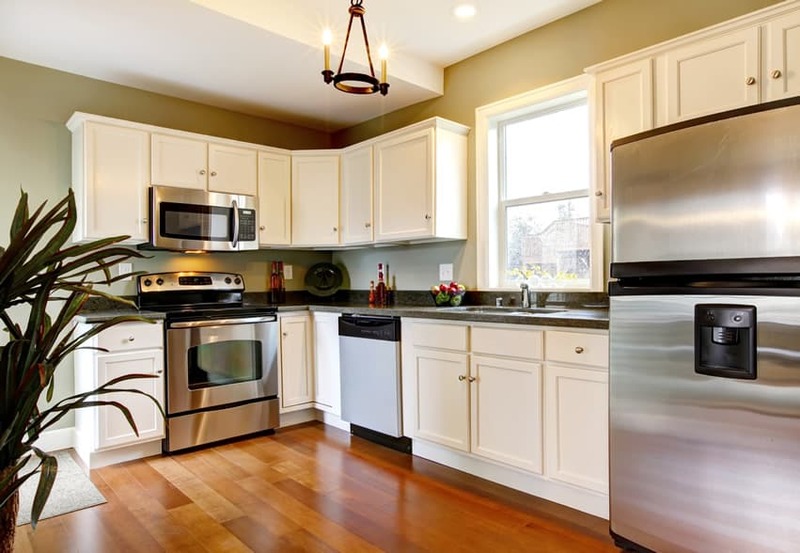 The kitchen shown in the picture above uses a simple L-shape layout. The walls are in a refreshing light yellow color and the ceiling is in white to help make the space appear bigger. 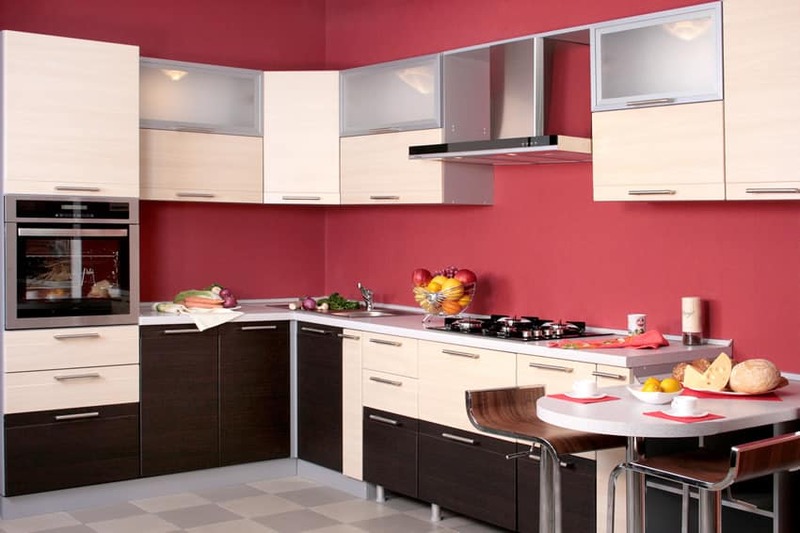 The kitchen cabinets are devoid of ornamentation and moldings, but instead uses wengue-stained wood cabinets. 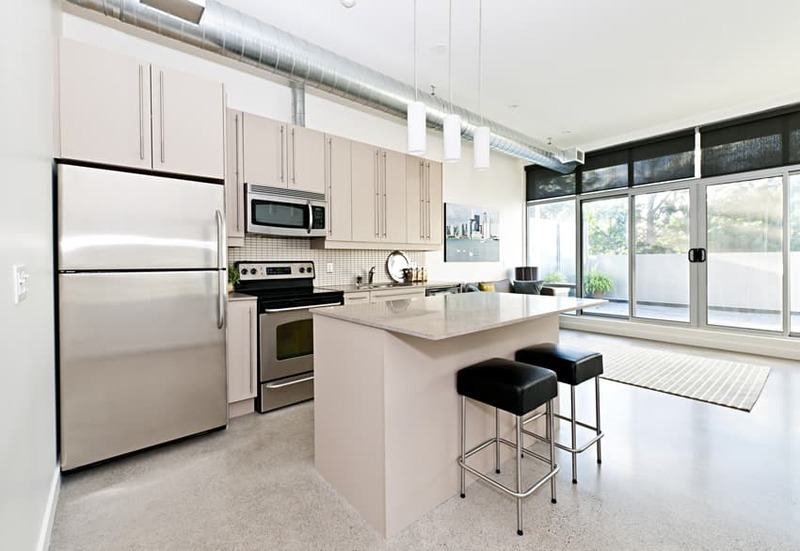 The lower portion of the overhead cabinet mixes the wengue cabinets with the use of frosted glass cabinet doors and stainless steel framing, while the appliances are low-profile stainless steel units. The countertop is solid-surface in an off white color, with a matching back-painted glass for its backsplash. So you want to make the most of your small kitchen space? Here are three simple tricks to help you stretch the space available. Make the most of your storage – Instead of closed cupboards or cabinets, try open storage. If you forgo doors on your cupboards or cabinets, this will allow people to see the walls behind and lend an illusion of space. Use glass – Full or partial glass doors will allow people to look in and still lend an illusion of depth. Mirrors have long been used to create the illusion of space; mirrored cabinet doors will also save the same purpose. Recessed storage space, shelving that is flush with the wall or cupboards that recess into the wall, adds storage without consuming floor or air space. Keep your storage space neat – Clutter takes up space, minimal clutter will help you navigate your kitchen easier and make the entire room seem neater. Neat, open shelves aren’t just storage space but attractive displays that lend character and atmosphere. Be creative with storage. Antique or decorative pot racks hung above your head free space and are a nice decorative touch. Baskets or trays to hold jars of condiments or essential utensils can ensure you locate what you need quickly without cluttering your countertops. Light but bright – Natural light makes a space seem more airy and spacious, use as much as you can. Windows should be uncluttered. Window dressings should be small and made of light material. An opaque shade or a gauzy valance is decorative while still letting in light. White walls will reflect light and makes the walls seem to recede. A mostly white color palette, such as white walls and cabinets will create a seamless space. Your eyes will take everything in without seeing boundaries and edges. You can use several shades of white or contrasting textures to keep it from feeling to sterile or bland. If you don’t want to use all white, go with pastel or light colors. A low-contrast color scheme, where you use several varying but similar colors, has a serene and expansive effect. When there is little difference between the colors of say the wall, the countertop and the woodwork, people’s eyes will glide over the surfaces and the movement will make them think the space is larger than it is. Look down – If you want wood floors, make them light colored. Consider using alternating strips of light and slightly darker wood for a striped effect. Stripes lend length and having striped flooring can “stretch” the floor space. Striped rugs can also have the same effect. If you want to use tiles or vinyl, consider using elongated geometric patterns to draw the eyes either lengthwise of vertically. A good pattern to use would be oversized diamonds. Make sure the diamonds create diagonal lines that give your eyes a longer path to follow so that the room feels wider. This is the second picture of the same L-shaped kitchen shown above. The unique design of the ceiling is also notable in this kitchen design, in which the flooring layout also follows. The kitchen’s porcelain stone tiles is separated from the small dining nook with a diagonal stainless steel tile trim which transitions into light beechwood engineered floors. The minimalist design approach in this kitchen is able to keep the clutter at the minimum and the the same time, provide the maximum possible space for food preparation. The eggshell white porcelain tiles helps reflect light to illuminate the kitchen, and the push-to-open high-gloss cabinet doors keeps everything clean and crisp looking. This second picture of this kitchen set shows a closer look at the counters. The black galaxy solid-surface countertop pops out of the white cabinets well, and the same material is also used for the small bar/breakfast counter. The sink blends seamlessly with the countertop as it uses the same solid-surface material, and even the backsplash uses the same type of solid-surface. 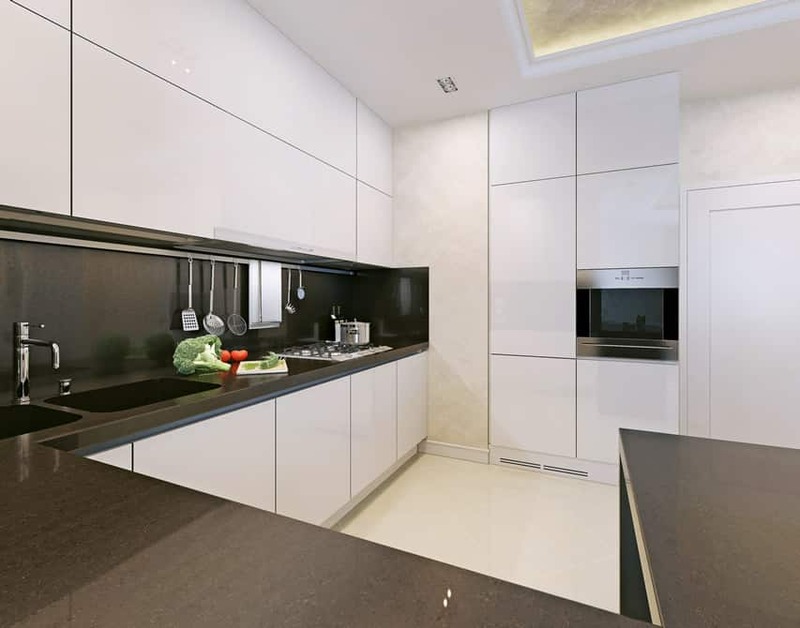 The exposed walls, to break away from the plain cabinets, are in off-white rag-rolled finish. 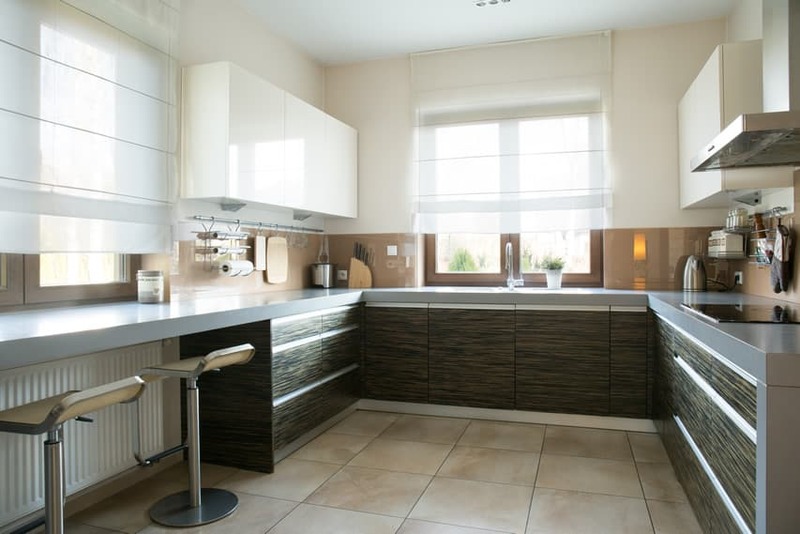 Many small kitchen layouts use a one wall design. 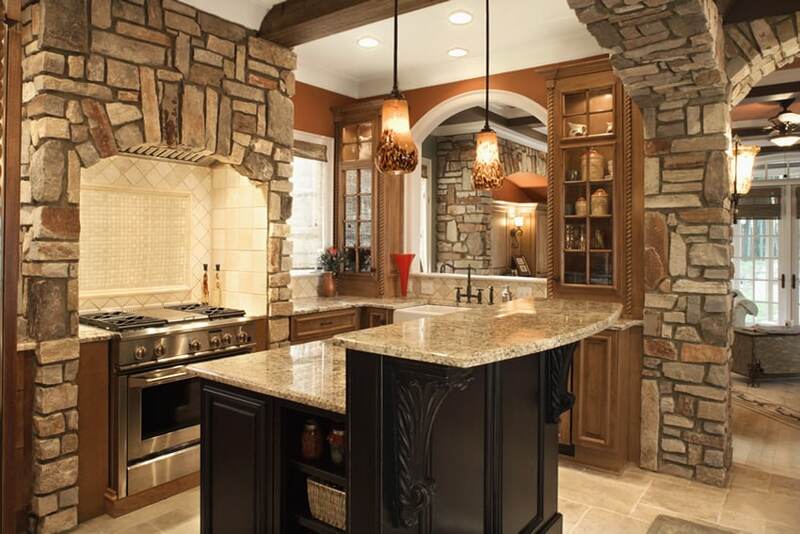 This room matches dark wood cabinetry with light beige travertine backsplash with beige granite countertops. 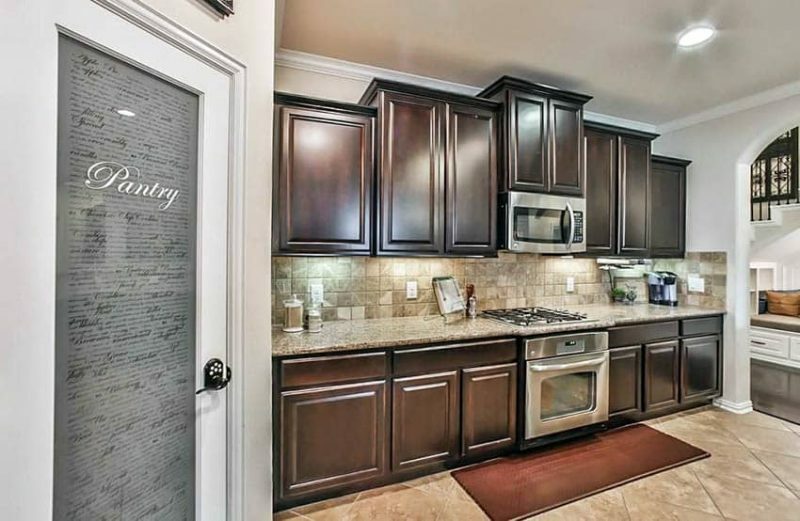 The large corner pantry room showcases a stylish glass door with cursive script writing. This kitchen has very bright choice of Maple wood floors and a little more subdued shade of mustard yellow-orange for its walls. Large picture windows and glass doors lets in much natural light, illuminating the kitchen area, the the white kitchen cabinets help brighten up the space. The countertops uses Azul Platino Granite, and the backsplash uses Blue and Orange ceramic tiles. 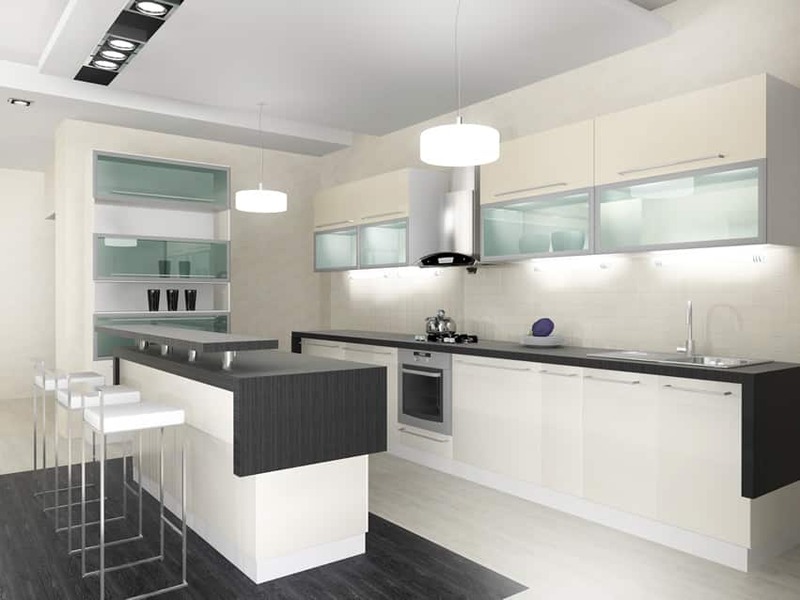 This modern kitchen design focuses on the whites and the blacks. Floor tiles are white porcelain tiles, with black accent porcelain tiles underneath the bar counter. For the ceiling, white is also the color of choice, while off-white paint was used on the walls. 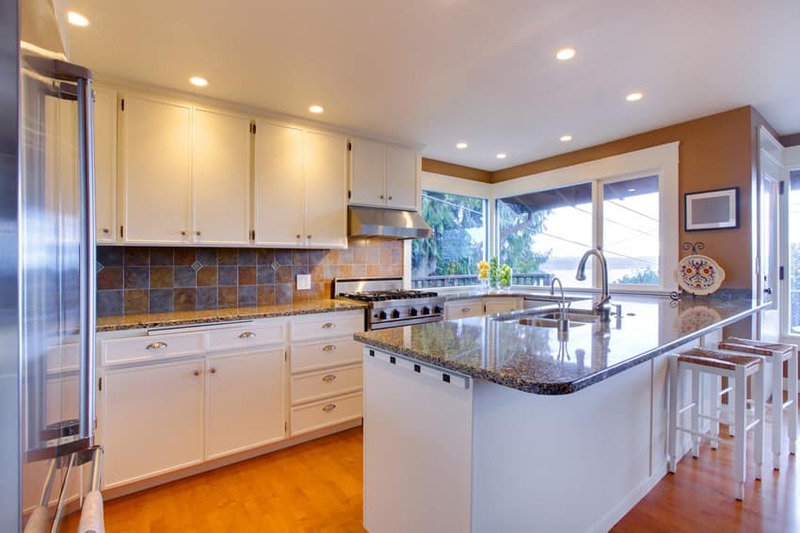 The under-counter cabinets and the pantry cabinet are all in white, while the overhead cabinets are in a cream shade with a combination of cream doors and glass doors. The countertop uses black solid-surface for a seamless finish. This tiny-packed kitchen was able to fit a French Door Refrigerator and a U-shaped kitchen with even a small bar counter/ledge. To help make the space appear bigger, walls were kept white, and even the backsplash color is white. The kitchen cabinets are all solid wood stained in a red Mahogany color, with a Kashmere white granite countertop which helps reflect and bounce off light. A modern kitchen with a playful approach in assigning finishes. Its red walls would be the first characteristic to capture your attention, making the rest of the lighter-colored elements of the kitchen stand-out. The kitchen cabinets combines an understated off-white/cream laminate color with a wengue color, and further combines it with stainless steel-framed frosted glass cabinet doors. The countertop material used is white solid-surface, further emphasizing its clean and minimalist look. This kitchen gives the feel of an old palace’s basement kitchen, only that this one’s brighter and more welcoming. Its arches and columns are clad with natural stone masonry, with exposed wooden beams and white-painted ceilings, giving it that “raw” look. 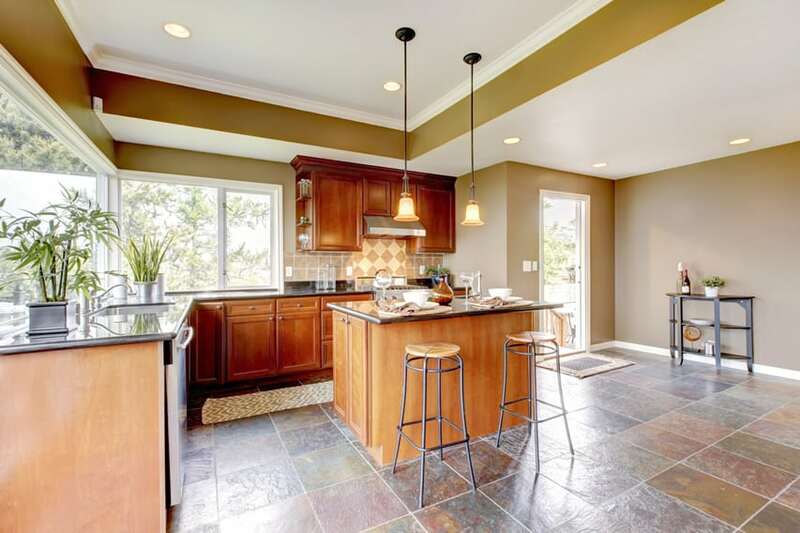 Walls are painted in a shade of brown that matches the natural Maple wood kitchen cabinets, while the door and window frames are all in white to visually separate it from the walls. Countertops uses gorgeous slabs of Beach white granite, and the wall behind the cooking range was finished with white mosaic tiles framed with diagonally-arranged ceramic tiles. This kitchen has large pictures windows letting in much natural light, and illuminating the lovely golden beige walls and stone ceramic tiles. 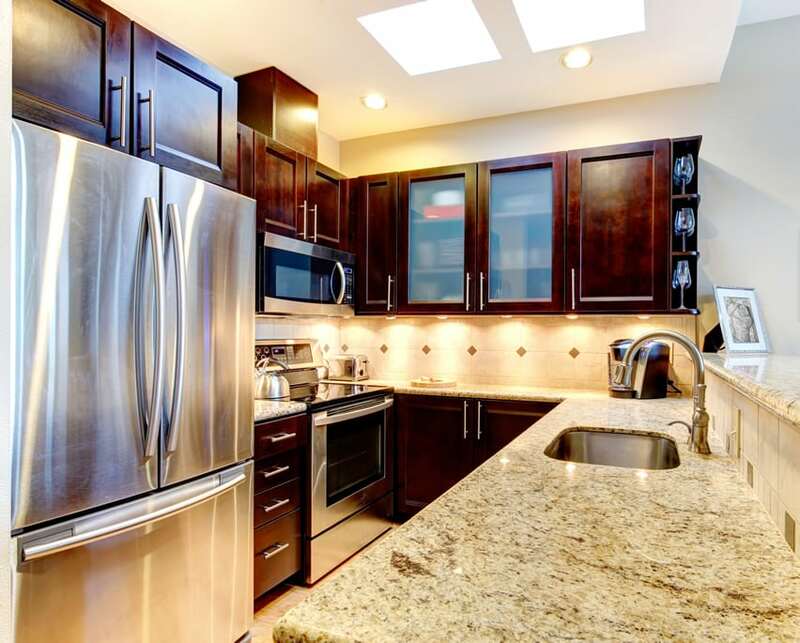 It also helps highlight the polished gloss of the black granite countertops and the Maple wood kitchen cabinets. The small island counter has a pair of metal bar stools and a pair of pendant lamps for additional illumination. The charm of this kitchen is its raw and industrial appeal – gray terrazzo floors, white walls, white ceiling and exposed ducting pipes. However, it goes for the “cleaner” version of the industrial style with its choice of colors and finishes. The cabinets are painted in a light cream color with a cream granite countertop to match, while the backsplash’s mosaic tiles is also in a light cream color. Small kitchen design ideas like this that have the benefit of an open floor plan can add an island for additional food prep space and a spot for eat-in dining. Another small kitchen which was able to maximize the multi-use potential of the space. Starting with the light cream ceramic tile floors, a similar light cream color goes up the walls and fades into the white ceiling. Cabinet doors are laminated with zebrawood with very modern continuous drawer handles. True to its minimalist aesthetics, countertop is laminated in gray, and overhead cabinets are in a high-gloss white finish, with a sienna graphicote backsplash. The gray laminated counter seamlessly goes around the kitchen up to the surface of the small breakfast counter/nook. 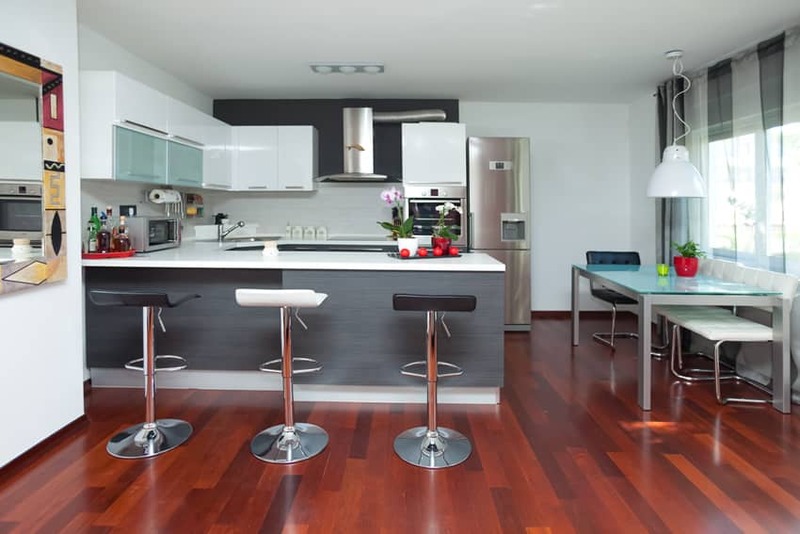 Typical of a modern style kitchen, this layout adapts a wengue and white palette. Walls and ceiling are plain white, with white porcelain tile floors and white solid surface countertops. Paneled kitchen cabinets are all in wengue finish with brushed stainless steel pulls and kickspace. Appliances would also be in stainless steel, and the backsplash uses a combination of dark brown and white ceramic tiles. 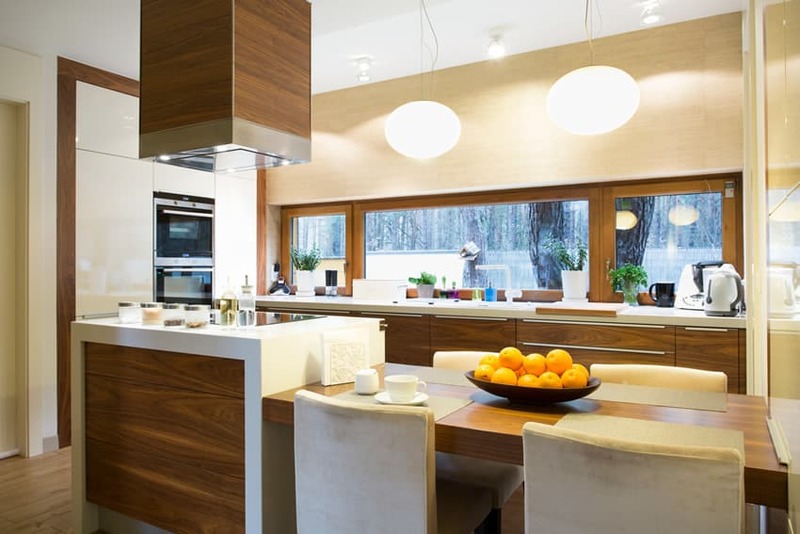 Fresh and light, this kitchen is the epitome of clean and modern design. It adapts a simple white and warm gray palette and has little to no ornamentation. 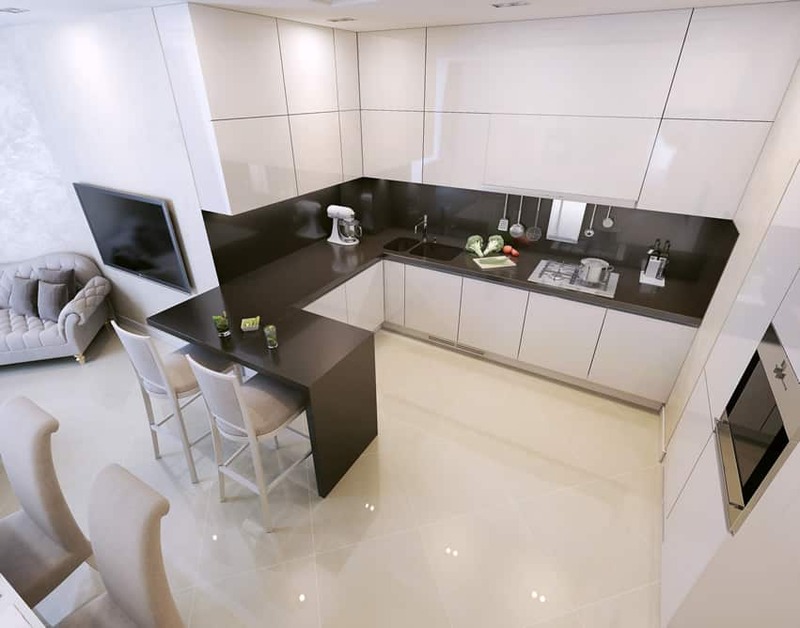 It is a line kitchen with an island bar counter, with white laminated cabinets and white solid-surface countertops. All kitchen accessories are of brushed stainless steel, while the backsplash and kickspace uses warm gray graphicote glass. This modern kitchen design has a beautiful combination of colors and finishes, easy on the eyes and gives out a warm and welcoming feeling. Solid wood floors are of a neutral shade of beech wood, while all the wood elements uses a Golden Walnut color, giving the overall warmth and character to the kitchen. Other elements like the custom kitchen island utilizes a lower area for eat in dining and an upper counter for meal preparation. The design’s countertop and the pantry/oven wall are all in white, while the overhead cabinets uses a cream shade of laminates and uses no hardware, making it blend into the wall. 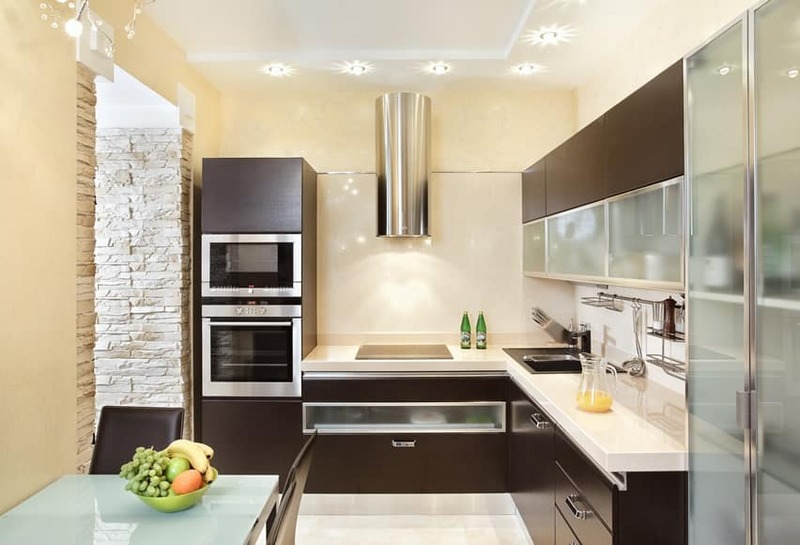 A kitchen design with the charms of both modern and classic design styles. The sage green walls gives an overall “aged” feel to the room and at the same time, helps make the eggshell white kitchen cabinets stand out. 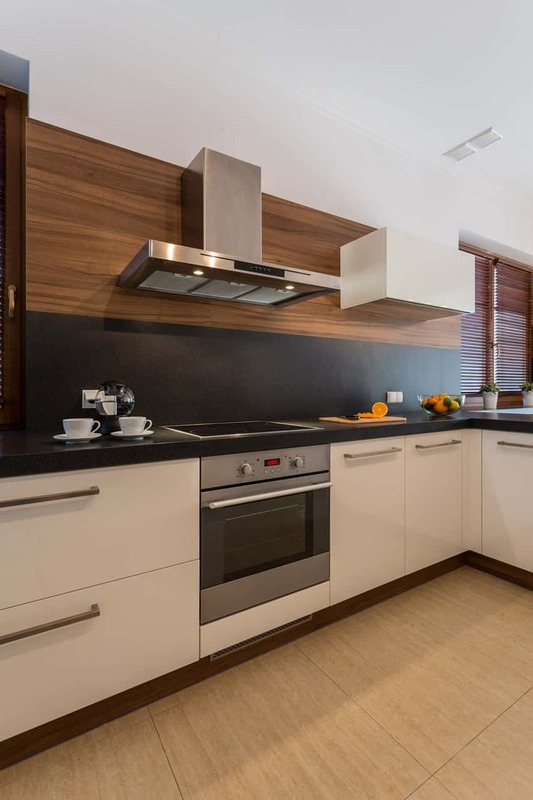 Black granite is the countertop material of choice to counterbalance the light appearance of the white cabinets, while the hardware used for the cabinets matches the rest of the appliances in brushed stainless steel finish. Floors are of solid Golden Oak, giving the kitchen a warm glow. 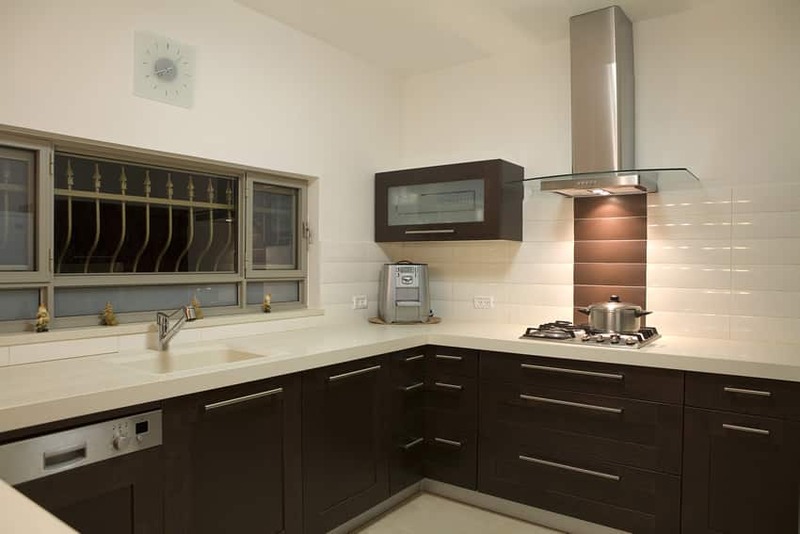 The most defining character of this modern kitchen design is its combination of Light Walnut wood panel and black solid surface for its walls/splashboard. While the kitchen cabinets are kept simple with white laminates and stainless steel hardware, the kickspace is noticeably clad in the same light walnut finish to contrast the light Beech wood ceramic floor tiles. 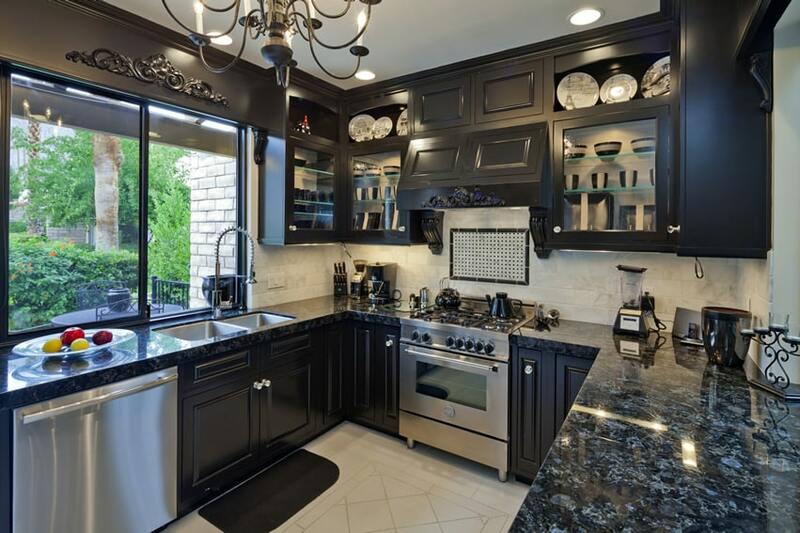 This kitchen has an interesting all-black neo-classic theme. The kitchen cabinets have molding details and are all in a black satin finish with stainless steel hardware, while the countertop uses Blue Pearl Granite. To balance the darkness, the white ceramic floor tiles helps bounce the light coming from the large windows and the artificial lights. Lastly, the backsplash uses white porcelain tiles to help brighten up the space. 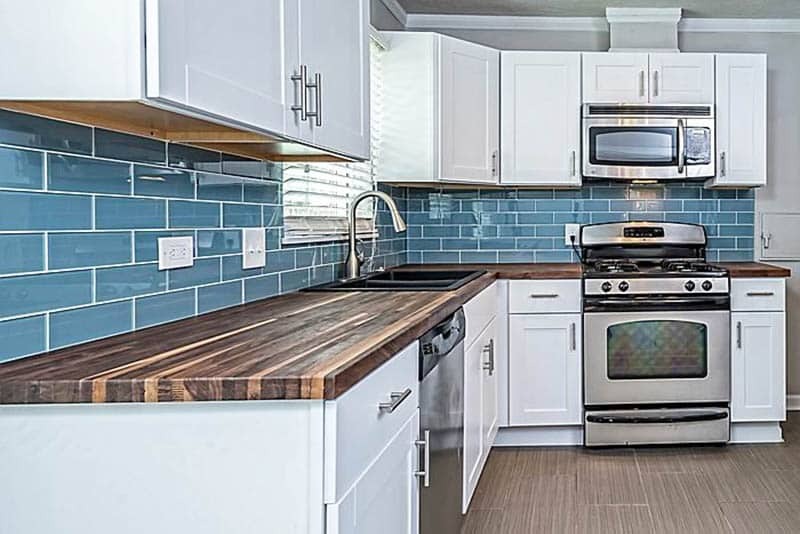 This small L-shaped kitchen features shaker style cabinets in white with large blue subway tile backsplash. A wood countertop provides plenty of contrast and matches the wood look porcelain tile flooring. While the floors of the space uses very bold rosewood floors, the walls and ceiling are all kept simple with white paint. 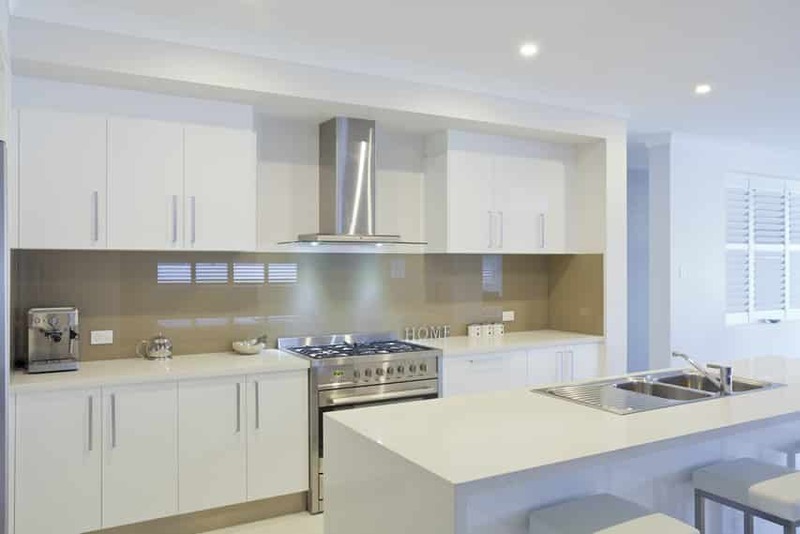 Following a modern minimalist style, kitchen cabinets are mostly in high gloss white combined with frosted glass and stainless steel, while the lower cabinets, including the bar counter, uses gray wood laminates, making the white solid surface counters stand out. For the backsplash, white subway tiles were used, with white grout to help keep the look clean and simple. This concludes our gallery of smart space stretchers for small kitchen design ideas. Make sure to check out our small kitchens with dark cabinets for many more exciting interior design images.